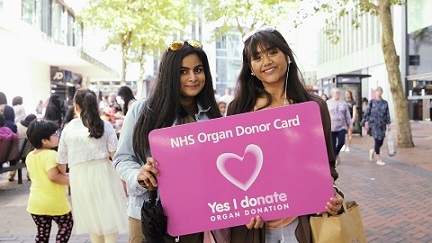 NHS Blood and Transplant published a funding call in September 2018 to enable organisations to apply for funding to positively engage local communities in organ donation, address myths and barriers, and increase support for organ donation among black, Asian and minority ethnic communities. This scheme is part of the Government’s commitment to building support for organ donation amongst hard to engage communities and we are aware that local trusted organisations may be more effective at doing this due to their specialist knowledge, understanding and standing in the community. Applications are currently being processed and the judging panel will be assessing the applications at the end of October 2018. While consent rates among black, Asian and minority ethnic communities for donation after death are increasing, families from these communities are far less likely to support donation going ahead than white families. NHS Blood and Transplant recently commissioned Agroni Research to carry out separate face to face surveys of black and Asian adults living in England and Wales to understand more about current attitudes. The lower levels of support and shortage of organ donors from these communities matters because 35% of patients waiting for a kidney are from black, Asian and minority ethnic communities. Although many black, Asian and ethnic minority patients are able to receive a transplant from a white donor, patients wait longer for an organ and others may die if there is no donor from their own community. One in five people who died on the Transplant Waiting List last year was from a black, Asian or ethnic minority background. Below are links to the documents made available to applicants. Please note that the application process has now closed and that applications are no longer being accepted. These documents are provided for information only.